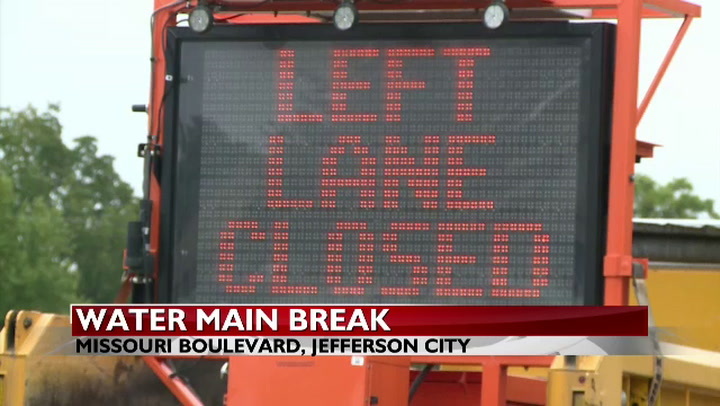 JEFFERSON CITY - A water main break caused flooding and forced portions of Missouri Boulevard to close late Wednesday night into Thursday morning and afternoon. The break happened near the intersection of Missouri Boulevard and Dix Road on Wednesday night. Crews first responded around 9:30 P.M. to the intersection, where they found much of the road underwater. Crews then worked to turn off the water and begin the drainage process. Mike Belt, MoDOT's maintenance supervisor, says the water pressure built up underground before breaking through the surface. "It's just like anything else, it can be like a volcano or anything else, it's going to find its path of least resistance," he said. Work crews stayed out through the night draining water and repairing the broken water main. By 7 A.M. on Wednesday, they began to pour concrete. Belt says that the the repairs are only temporary, and drivers should take caution while passing through the affected areas. "These are just the emergency repairs. There is still damage to the entire block, and we are assessing that now. The pavement in that block is going to be a little bit rough, and we are still working to have a final repair on those," he said.